In addition to the overshadowing lifestyle restrictions associated with his current situation, he recently broke his foot and is now dependent upon a protective boot and crutches (Don’t know what happened to cause the fracture. He is still suffering from osteopenia from the toxic cancer treatments and his bones are brittle as egg shells. It just broke). Other than just being his friend, doing one’s best to keep his spirits up, there are few tools in the fun-box. Of course we have games, cards, videos, art projects, etc. ; but having lived virtually the last three years in a state of such amenities, boredom does take its toll. In addition to the imperative condition Tara and I maintain for the entire family remaining together at all costs, on days like this, the Brothers come in real handy. Most days we eagerly await the mini-outing associated with picking the brothers up from school. After all, it is a change of scenery. So that Monday, we left the St. Jude campus just in time to make the carpool line. Nat and Christopher have thankfully plugged back into this welcoming and understanding school community with ease strong composure. Of course we chalk this up to the simple nature of the Montessori culture. Finding ourselves back in Memphis unexpectedly with an unknown time-table, the Maria Montessori school is, for the third time, a Godsend. Cresting the Mud Island Bridge, the Mississippi River consumes the horizon. That day it was swirling downstream at more than full tempo. Back in October, it was as low as I have ever seen it, pocked with sandbars and bulkheads that had yet to reveal themselves during our three years here. But if these three years have proven anything, it is abundantly clear that things do change. Turning into the school lot, the Brothers rushed through the rain from the cover of the little yellow school house; hunched over, splashing through puddles and quickly closing the door. “Brrrrr,” they both groaned, shaking their wet heads. Before I could rhetorically ask “How was school today?”, Brennan announced, “guess what guys, we are going to church this afternoon.” To my pleasant surprise, there was no debate. We had missed church Sunday, the day before. Additionally, I had been feeling a little rattled and anxious for several days. For weeks, actually, Tara and I had been eager to begin the process of distilling down the layers of medical opinions and data regarding Brennan’s status to a digestible scope which would hopefully allow us sufficient comfort to schedule our return home. Unfortunately, the threat of his last setback was menacing enough to keep our camp intact here in Memphis for a while longer. And there is still much unknown. Brennan’s status remained clearly unclear, which was taking its toll on our nerves. But this also happened to be the first day of what we knew to be a critical and potentially decisive week for our dear friends and partners in Press On, Stephen and Erin Chance, who were anxiously awaiting the results for Patrick’s scans at Emory in Atlanta. Outside of the St. Jude community, they have been the only family we are close to who have tasted the steely sharpness of the brink, which establishes in one’s being a very odd frequency of sense and presentiment. The Chances are always heavy on our minds, as we try to remain dialed into Patrick’s status. That day, the signal was especially strong. Working all day in her makeshift office near our squatter’s residence in South Bluff, Tara sounded relieved and grateful for the call to join us at St. Mary’s. She had had a long day away from everyone, while also affected with a funny feeling similar to mine. She said she would meet us there. By 5:30 these days, it is dark in Memphis. Leaving our car, our collars were held tight. The three boys and I huddled through the windy drizzle from the parking lot to the church. Brennan, struggling a little bit on his crutches up the wet walkway asked me carry him inside. I picked him up, and clutching my neck, he, the boys and I, quietly entered the beautiful sanctuary which was unexpectedly dark and empty. We were the only one’s there. A single chandelier lighted the alter and a single table at its base. On the table were a wreath and four standard Advent candles. Two were lit. Were it not for the candles, the boys would have been convinced that a service was not to take place; but from wings behind the altar emerged Deacon Ernie. Ernie had been one with whom we often found honest compassion and friendship during the rough winters of 2010 and 2011. Serving as a eucharistic minister for St. Jude, he made the rounds at least once a week and always stayed to talk. He would deliver encouragement to Brennan, and brought the understanding and kindness of an old friend to me and Tara. He walked over to the alter and placed a bookmark on the day’s readings when he looked up tp realize that he knew the only four people in attendance so far; and not previously knowing that we were back in Memphis, he cheerfully walked to over to greet us. Reaching his hand out to the boys, Brennan removed his wool ski cap, revealing his new thick head of curly hair. Delight and surprise illuminated from his smile. With this greeting, in walked Tara, along with two other couples for the quiet afternoon service. He gave Tara and long hug, then walked to his station to begin the service, which commenced with a refreshing feeling of impending significance. The consequential part did not stop with Ernie. While it was he who conducted the ceremony on this one day we happened to drop in, the scripture reading for that day grabbed us hard. It was the story of the man presented to Christ by his friends for healing. In the story, these men were so determined to cure their friend that, for their cause, they resorted to the removal of a roof and ceiling in order to lower the man down to Jesus on a stretcher. There were throngs of others there seeking the attention of Jesus, blocking all conventional entrances to the house. Listening to Ernie, I held Brennan and reached over to hold Tara’s hand. Ernie stepped toward his small congregation and spoke about what makes this “miracle” story different from the rest. The common thread of all miracles is “faith,” on behalf of the one to be healed or saved, and “love,” on behalf of the healer. Regardless of whether one puts stock in scripture or not, these two commonalties are universal in their premise. But, we were also reminded that there is often a third element; that of “friendship,” as exemplified by the men who went to extraordinary trouble to deliver their friend to the only person in whom they found hope for his cure. They were so determined to help that they ripped the roof off of a house. The condensed version is this: a soul, faithful because of love and friendship. Whether in immediate desperation, or plodding along the the more typical, but always terminal path of life, is this not the story? “All good things come in threes,” so they say. It is the “magic number,” and of course the religious and spiritual connotations of the number are enough for their own weekly blog. The number “three” has been bouncing off the walls lately, particularly this holiday season. And ending this third week of Advent, we still find our faith tested, bolstered by the loving intent of our caregivers, while praying intensely for so many who seek healing; both for our friends and for our own family. What has now turned into our third tour of duty in Memphis delivered just weeks ago our third Thanksgiving celebration here. This year’s was quite different, marking the first in three years that all three of our children were seated around the table together, with us. Brennan even ate his meal. And, I am delighted to report, he is still eating. This one seemingly pedestrian function has been the most noteworthy of barometers, indicating the most remarkable sign of improvement since returning here in October. He is here because of Graph Versus host Disease (GVHD). Leaving MCG for St. Jude, the symptoms were clear; but we were not aware that it had progressed to “stage 4” GVHD of the stomach and digestive tracts. Of course this whole mess was all triggered by a common cold, which he caught along with the rest of Augusta in mid-October. While his immature immune system (keeping in mind an immune system which was and remains suppressed with immune suppressant medications and steroids) did respond to the cold virus, the simultaneously went a little haywire. With the immune cells (“little soldiers” if you will) mobilized and armed to fight the viral bug were not programmed to stop their attack (The “fall back!” command has yet to be programmed into their minds.). Keep in mind that one-half of Brennan’s immune system is a total mismatch (in a haplo-transplant situation, or parental transplant, only one-half of the parent’s immune system will match the child’s (right? It takes two to tango). Therefore, the “foreign” soldiers who were on the prowl for the virus, simply kept on the prowl, and began attacking anything that crossed their path. Kidneys, Liver, stomach, intestines, skin… his entire body was seen as foreign and, hence, became prey to his own immune system. When we arrived in Memphis, it was frightening. The response to a situation like this is to further repress the immune system, effectively shutting it down. While he was already taking the daily medications mentioned above, he had actually been significantly weened from most of them and was looking at the first of 2012 as a possible milestone for freedoms. But sooner or later he was going to get tested, Unfortunately, it came sooner than later, and the test was a bit stronger than one would have hoped. So here he is, all dosed up and no place to go. Instead of a moderate flare-up with the immune system, we ended up with a forest fire. The suppression involves effectively throwing a wet blanket over everything (two immune suppressant drugs and steroids, plus all of the necessary antibiotics, anti-fungals and anti-virals necessary to provide supplemental protection until he is once again weened.). Once under control, as it now seems to be, the system removed thread-by-thread until we are absolutely certain that there are no flare-ups. Fortunately, the process is very deliberate; and, therefore, very slow. Each flare-up from this point forward can foster what us called a Chronic GVHD, which is the leading cause of non-relapse morbidity in transplant patients. This potentially terminal form of the disease transpires over time as the naked and unprotected immune system remains stifled by constant immune suppressant medication, which must delivered for the whole purpose of preventing the victim of burning up inside-out. It is a losing game that we wish not to play. In October, Brennan stepped out onto the court for a few sets, but fortunately our team here called the match. Dr. Leung tells us that, for the foreseeable future, Brennan CANNOT get another virus of any sort, as he is currently too revved up inside not to avoid chronic GVHD. But, again, he is feeling much better. He is eating for the first time in three years. He is active and impatient (all good signs). Going for rides in the car has become our primary form of non-home-bound recreation, giving him a change of scenery from the hospital and the house. He and the brothers are constantly jabbing each other in the back seat with a new game called “punch bug,” wherein the observance of a Volkswagen Bug delivers both authorization and consent to hit your neighbor in the arm (Fortunately, Brennan does most of the hitting, and is never the recipient of much more than a tap on the arm). He is being weaned from the drugs slowly but surely, and time will tell. But the walls of his bubble are as thick as they have every been. With stage 4 GVHD, we have become even more vigilant about what he can and cannot do. While most of our friends recognize the fragile nature, and hence the gravity of infections, we often find ourselves having to justify why we are not able to participate in certain social and recreational functions. But Brennan’s exposure to anything even remotely dirty is highly likely to trigger an immune response that can trigger GVHD. This qualification takes into account pretty much the outdoors, public places, the sun; effectively the world which exists outside of the imaginary bubble. His system is so hyper-suppressed right now that his clinic visits will remain at least weekly for the foreseeable future. And, despite the encouraging signs, he is simply too medicine and hospital dependent, and too fragile, for us to return home for good. The stakes are just too high. So here we are, and here will stay until we are otherwise comfortable to return home for good. But we are positive and still have faith, bolstered both by the love and care he receives here as well as the friendships which abound everywhere. But regardless of where we are, or where we end up, we embrace these three common principles, for Brennan’s sake and for the sake of his friends and all who’s hope is thusly conceived. 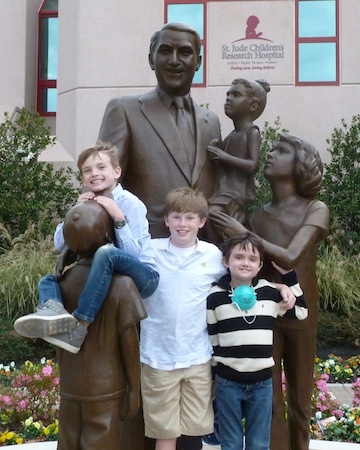 I think most of Brennan’s Carepage readers now know that our apprehensiveness with regard to Patrick’s scans, for which we prayed at church on that cold and wet Monday evening, was explicated when we learned the following Thursday that his cancer has metastasized to his liver and that there are no more treatment options. Our friend, who reached through the ceiling for Brennan, delivering love and hope with tethers of his own tenacity and faith, defines for us the third element which has kept our spirits buoyed and our own determination strong. I have to admit, with so many miraculous examples of friendship delivered into our lives, that gratitude often feels hollow when offered for an innocent child who suffers. But it is the only thing with which we can remain connected. It represents the very fiber of the ropes which connect each of us to those strive to help, and from those whose friendship delivers our own broken souls a place of hope and restoration. I heard about Patrick not in Memphis, but while on a business trip in Hall County Georgia. It was a trip that started the day after our lesson at St, Mary’s. And it was a trip that began with anxiety on my part for leaving Brennan and the boys for the first time in a while (for those of you who have not read the Carepage entry regarding this difficult message, please note that Erin and Stephen Chance are strongly urging all to please refrain from discussing this with your younger children. They are carefully attempting to manage what their children, particularly, Patrick, hear from others. They are desperately trying to ensure that Patrick’s last months and weeks are filled with hope and joy. We therefore, echo their humble request to remain mindful of what you say, and possibly hear, on this burdensome subject). I was in a meeting when Stephen called to tell me the news. Sounding as strong as a father can under the grip of such suffocating emotion, he triggered my own recollection of how a father feels when he is told there is nothing more to do for their child (All I can say is that it is worse than you can imagine.). I floundered my way through the rest of the day with single-minded intent to just get my work done, return to Memphis and hug my family. Boarding the Marta train on Atlanta’s far North side for the airport, I meandered my way entirely through the entire length of the city. Neighborhoods and commercial centers flickered by as we made our way to the airport. At each stop, people boarded and un-boarded through this transitory place, leaving places or seeking new ones. The common detached look of people traveling renders an emotionless veil, concealing emotion. I too looked about stone-faced. Inside, I was crying. A man in front of me stood, offering his chair for an elderly woman, burdened with too many bags for someone her size. He sat next to me, I turned my head away from the dilapidated smell of moth balls and old clothes. More than anyone onboard, he looked displayed an expression. He seemed sad. I wondered if or for whom he prayed. Was it himself or someone else? Was he alone? Was his heart open to to the love others… to God? He was clearly a thoughtful individual by virtue of his exchange with the lady. Could he be helped from recognition for this courtesy? I thought, but I failed to reach out. As I turned my head away toward the window, the intercom announced our arrival at Five-Points. We stopped and he stood to leave. A passing train stopped at the platform across from ours. The darkness of the underground station was broken by the lighted windows of the adjacent train. It was filled with school children Brennan and Patrick’s age, dressed in their blue khaki pants and skirts with matching white shirts. A group of girls sat across from one another. Someone spoke and they simultaneously leaned forward with delight and laughter. Behind them the boys all stood in a group. A pair of skinny arms stretched and struggled for the hanging hand straps. One pushed another down into a seat. The victim looked up at his adversary with surprise when a friend intervened. He was clearly defending his buddy when our train lurched forward and departed the station. Thus concluding my silent cinema. Our train reached its destination, allowing me to focus on the ordinary tasks of making my flight on time. Leaving on schedule, I noticed that we were taking-off in an eastwardly direction, opposite of Memphis. It was minutes before sunset. The city’s street lights were on, but one could still make out the buildings and rooftops below. Turning northward, I looked down to see a telltale serpentine row of lights, representing the signature outline of Olmsted’s parks along Ponce de Leon Ave. This was the Druid Hills neighborhood, where the Chance family was presumably sitting down for dinner, probably, at that very minute, with friends stopping in for support. Looking down, I made out the Druid Hills Golf Course and Emory University and, from there traced my way up N. Decatur Road to the Chance’s House. The jetliner turned just so and my window miraculously framed their home, with Patrick’s tree house, toys and balls of every variety presumably still where I saw them last, darkened with imminent nightfall but anticipating another day for play. Staring straight down at that house, I focused for as long as it remained in view, prying the rafters with my prayers for a family and their courageous little boy who’s example is forever bound to whatever faith we can and will ever conjure. We celebrate their family this Christmas. And, God willing, we will celebrate with ours at home for the first time since 2008, among old friends from Augusta while bolstered by the strong friendships that remain in Memphis until we return (If things go as planned, we will be home for over a week, thanks to an approved leave of absence and the effective collaboration of our team at St. Jude and MCG.). Because of friends, we gratefully receive the gift of Christmas this year under our own roof. They honor and humble us with the gift of their love, therefore binding us for all time to the love of God. Things change. This does not. Absolutely, the most great factor that is considered while purchasing medicaments from the Web is to make a best choice. To purchase medicaments online from a preferred web-site is safe. Other medicaments are used to treat complaints such as hair loss. What about buy propecia online and alopecia? Very likely every adult has heard about buy propecia. (Read more finasteride online). A extended medic condition present is hair loss. What medicine does treat alopecia? Most of patients using this medicine mostly do not have any side effects to Finasteride. Even if this remedy is not for use in women, it is not known whether this generic could harm a nursing baby. I was so sorry to hear about Patrick. My prayers are with his family, and yours, as you face the coming days.